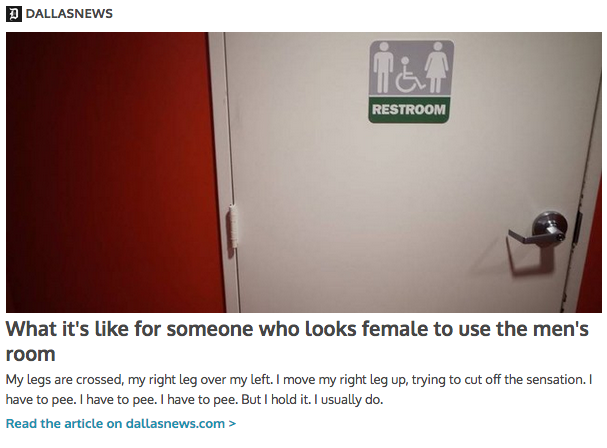 Last Thursday I had an essay published in The Dallas Morning News about what it’s like to appear female and use the Men’s restroom. When talking about this “issue” so rarely do people seem to consider what happens when a transgender or gender-nonconforming person uses the Men’s room because they were born male. What happens? Guys get uncomfortable. Some leave. Others glare. And some confront me. When I walk into the Men’s room, I feel like prey. And the “what could happen” is always a very real fear that is front and center. I feel like this is a perspective that is missed between trans/gender nonconforming people who are “legally male” using the Women’s restroom and the “scandal” it stirs up along with a bunch of conservative politicians making it seem like a capital case despite what many of their constituents think or feel. My essay was excerpted in Sunday, September 11, 2016 print edition of their paper. It appears between an article about the Texas Attorney General having dinner with the family of a transgender child and an election piece about Trump and Hilary. (Page 4P.) I couldn’t ask for better coverage. I hope you’ll take the time to read my piece. Even if you agree that people should just be allowed to pee without it getting political, perhaps you’ll consider why. This entry was posted in culture, Current Events, Equality, Journal, LGBT, Opinion, Politics, Thoughts and tagged bathroom, bathroom bill, bathroom issue, Dallas Morning News, gender, Gender Identity, gender nonconforming, transgender. Bookmark the permalink.